Crafty notions are just part of the fun. 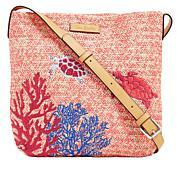 This Vera Bradley bag gives you a coveted design in a hands-free option. Sprightly things happen when you carry a charming, yellow fairy bag. This crossbody renders a glow and happiness every time you wear it. Complete with all the makings of classic, the glittered details and animated facial expression gives every ensemble you pair it with, something truly magical.